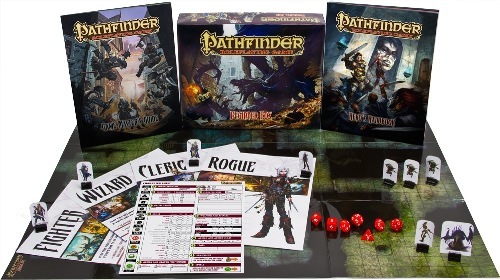 These are the streamlined Pathfinder RPG rules and the best way to learn the game. These rules take characters up to Level 5. Hero’s Handbook (ask Grandmaster for a copy) – How to create your character, and rules for adventuring and combat. Beginner Box Player Pack (expansion) (PDF) – Includes the barbarian class and new equipment and options! Game Master’s Guide (ask Grandmaster for a copy) – Includes a beginner dungeon and rules and advice for creating your own adventures. Beginner Box GM Kit (expansion) (PDF) – Includes a second beginner dungeon and more monsters and magic items. You get a new feat at every odd-numbered level. Here is a list of the feats (PDF file) available to Beginner Box characters! Email guildgrandmaster AT gmail.com your completed character sheet with a picture to get a Hero Lab character sheet! I’ve now linked it to the PFBeginner website. (I think I might have previously posted a PDF from the document itself which I later put down for copyright reasons.) Thanks for letting me know!